India’s No.1 CCNP Training in Pune | Those who are Sucessfully completed CCNA Exam and Wanted to do CCNP We are one who Assure You to Pass CCNP Exam. The CCNP(Cisco Certified Networking Professional) Certification is one among the vital certifications from Cisco that a networking skilled should ought to move ahead in his career. The CCNP Training in Pune coaching is currently in nice demand inside the IT business and over the recent years has become a worldwide customary for several prospering IT firms. The importance of achieving the CCNP Certification can’t be stressed enough. This certification from CISCO has accepted everywhere the globe because the best within the field of networking and is ideal for people that want to stand out within the field, for those that ar able to advance their skills or those that are making an attempt to induce into high positions in their networking career. The CCNP Institute in Pune conjointly equips the network engineer to figure severally on advanced network solutions. CCNP TSHOOT which validate the ability to implement, plan, verify and troubleshoot local & wide-area enterprise networks. The course covers topics like IPv6, VLAN, VOIP, OSPF, Wireless, BGP, EIGRP, VPNs, L2 / L3 Switching, VTP,HSRP, VRRP, GLBP,Troubleshooting methods. 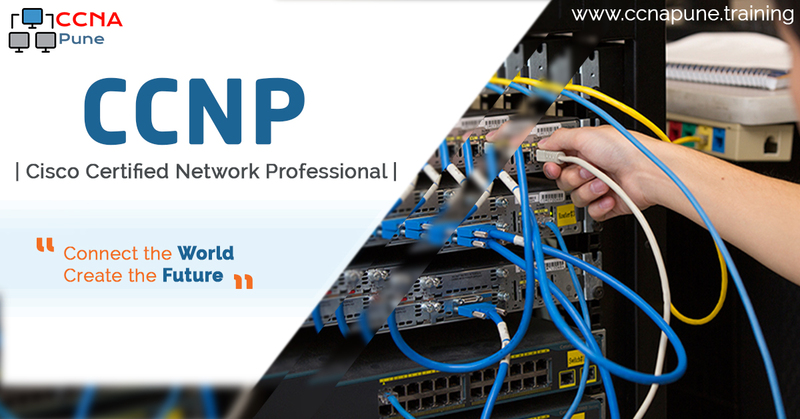 Why to join CCNP Pune ? Excellent training of CCNP from certified and highly experience trainers. Excellent career guidance as per students interest and for their career growth. 100% guarantee for CISCO Certification. Personal assistance with minimum strength of students. Availability of essentials devices like laptops, routers and switches. Focus on training on real devices – actual routers and switches. What do we cover in CCNP course (Syllabus) ? The ROUTE 300-101 exam will certify that the successful candidate has the knowledge and skills necessary to use advanced IP addressing and routing in implementing scalable and secure Cisco ISR routers connected to LANs and WANs. The exam also covers configuration of secure routing solutions to support branch offices and mobile workers. Document results of OSPF implementation and verification plan. The SWITCH 300-115 exam will certify that the successful candidate has important knowledge and skills necessary to plan, configure and verify the implementation of complex enterprise switching solutions using Cisco’s Campus Enterprise Architecture. The SWITCH exam also covers secure integration of VLANs, WLANs, voice and video into campus networks. The TSHOOT 300-135 exam will certify that the successful candidate has important knowledge and skills necessary to (1) plan and perform regular maintenance on complex enterprise routed and switched networks and (2) use technology-based practices and a systematic ITIL-compliant approach to perform network troubleshooting.